A very damp misty evening put a few people off but over 30 turned up to tackle the mind-boggling (for some) ups, downs and arounds of the Spirals. Pre race favourite Tom Saville lived up to the pressure and won comfortably in 28:28 – the 4th fastest ever and improving last years time by well over a minute. His closest competitor would have been Max had he managed to complete the course but having been awarded the Pertex Trophy the previous weekend for gross navigational incompetence the money was odds on for a DQ and he duly delivered. In the Women’s race Charlotte Ward ran away with a comfortable win and has the most consistent times of anyone over the years – 33:41 this year, 33:45 last year and 33:42 in 2014 – still 20 seconds short of the record though. 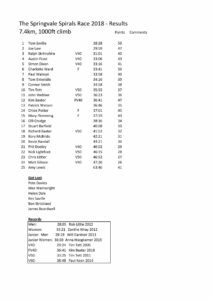 Kim set a new Women’s V40 record and If John Webber can hold his consistent form for another year he’ll be in with a change of the V60 record next year. New Cod on the Block delivered some excellent post-race Fish and Chips washed down with Beer and Tea. Just two striders turned out Phil Dooley and myself, John Armitage cried off as it was a little cold for him.